Exceptional nice original Heer M40 Mantel in great, near mint condition. The mantel is a nice medium size and dated 1940. There are a few moth holes at the absolute bottom of both sleeves about 1mm. Otherwise there are no damages. The inside has a stain in the back which looks considerably less obvious in real life. The mantel retains all of its originally sewn buttons and is a great unissued piece! Nice Luftwaffe issue pullover shirt marked LBA 41 inside the collar. The shirt has provisions for shoulder straps but as far as I can tell never had a breast eagle applied. 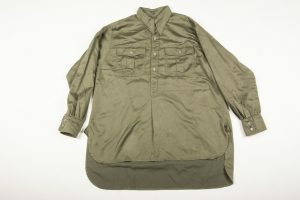 Hard to find early Luftwaffe tropical shirt with glass buttons! 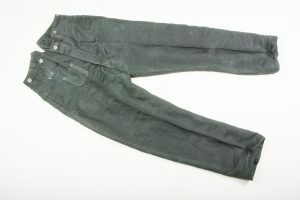 Rare issue Luftwaffe Fliegerbluse in blue grey Drillich or hbt material. Standard issue Luftwaffe cut with blue glass buttons and insignia for a Oberleutnant Der Flak. The breast eagle is a nice bullion variant neatly sewn to the jacket. The left breast has two period sewn loops for a award. 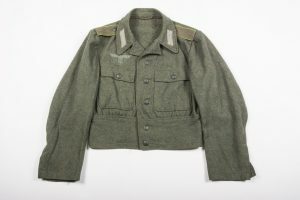 The shoulders are adorned with a set of Luftwaffe Flak Oberleutnant shoulder boards which show the normal wear as suspected with the buttons nicely embedded. The collar is nicely piped with a neatly sewn silver wire. 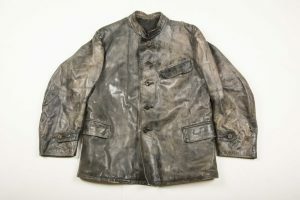 The jacket is in nice worn condition but is void of repairs or alterations. A nice and rare garment, first one I’ve ever seen! A fantastic unissued Fallschirmjäger jump smock with white plastic RiRi zippers and factory sewn breast eagle. The garment is made out of nice heavy quality cloth. The ‘hard edged’ Sumpftarn camouflage pattern is vibrant and full of contrast. The smock is nicely marked smock is well marked with RBNR. 0/0708/0001, size IIb and dated 1945 (!). 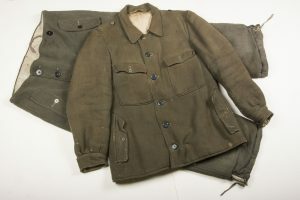 The smock is a excellent example of a late war jumpsmock as worn and issued to troops early 44 and onwards. The smock is untouched and perfect and not modified in any way. 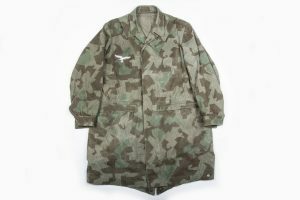 If you’re looking for a mint late war smock, this is it! 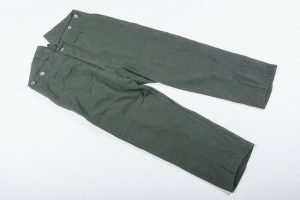 A nice issued pair of Luftwaffe M40 trousers. The trousers are a nice mannequin size and still retain most of the nap on the wool. There are a few surface moth nips on the bottom which is normal for these garments after being stored for so long. A great pair in lightly worn condition that would look great on a mannequin! 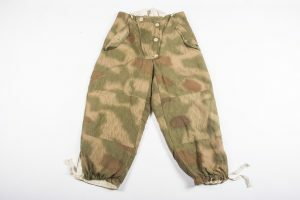 Scarce mint condition M40 type field combat trousers in HBT or Drillich material. A nice big size for mannequins and in stone mint condition. Can’t be upgraded! 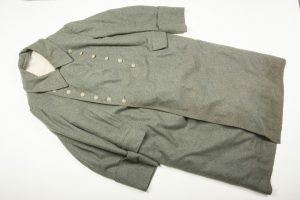 Heavy fully lined Kriegsmarine or Küstenartillerie guard coat or Wachmantel in very good condition. 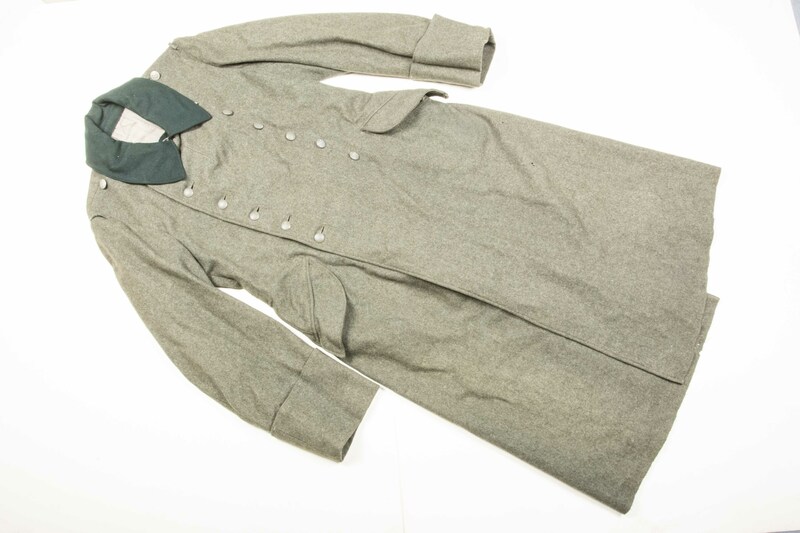 This garment was recently discovered in a cloth processing plant and has never been in a collection before. It’s missing one button on the shoulder and has a few moth holes. Otherwise a very nice garment in lightly worn condition. 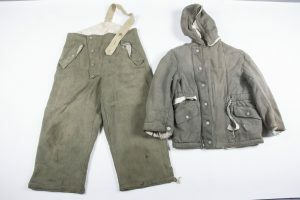 The coat is fully lined with thick sheepskin creating a very good insulation for the sometimes arctic temperatures at for instance many of the Küstenartillerie batteries in Norway. Hard to find! 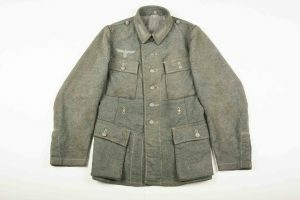 A nice original and combat worn German paratrooper smock or Knochensack marked Rudolph Hubert & Cie 1.A B.42. 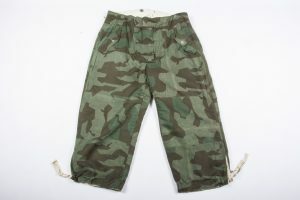 Manufactured from heavy twill material with parts out of Grünmeliert smock material. One period repair to the back skirt. The smock retains all of its period sewn buttons and rust free press studs. The zippers are marked Elite and are all in functioning condition. The smock retains nice and vibrant colours with a nice light use just perfect for a combat mannequin. The breast eagle is resewn but original. The smock is a very nice large size fitting for most if not all mannequins. 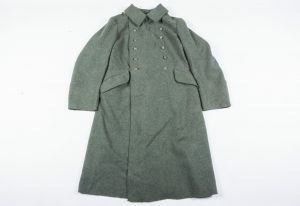 This smock was surely worn during the war and has loads of character. Hard to upgrade original Fallschirmjäger Knochensack in honest worn condition! Rare Heer tropical pullover shirt. Typical Afrikakorps type pullover shirt or Diensthemd für Tropen. 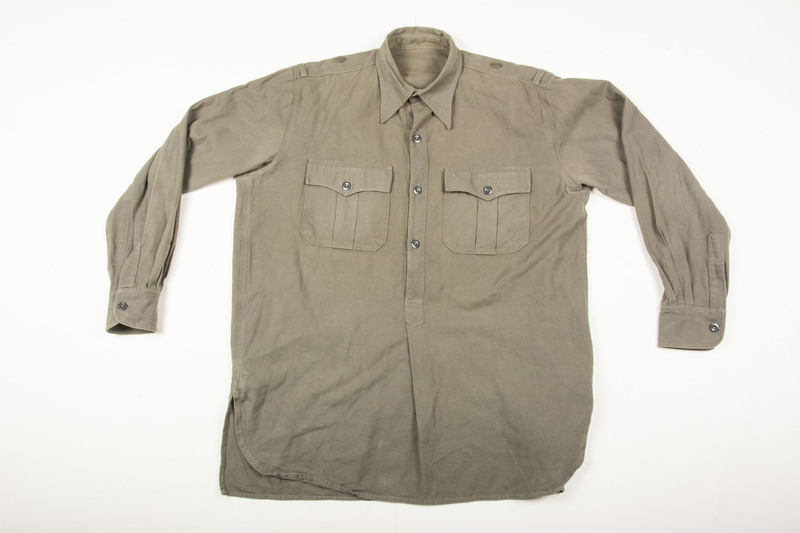 The shirt is made from a grey olive coloured cotton with blue glass buttons. The shirt has buttons and buttonholes for shoulderboards. Ink stamped in the collar area B. Rawe & Co 42 and in a nice large size. Rare and textbook tropical shirt in mint condition! Rare Heer tropical pullover shirt. Typical Afrikakorps type pullover shirt or Diensthemd für Tropen. 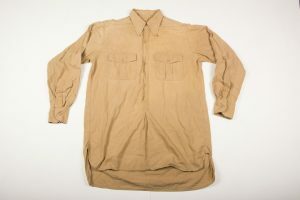 The shirt is made from a olive coloured cotton with olive coloured paper buttons. The shirt has buttonholes for shoulderboards. Ink stamped in the collar area and in a nice large size. Rare and textbook tropical shirt in mint condition! 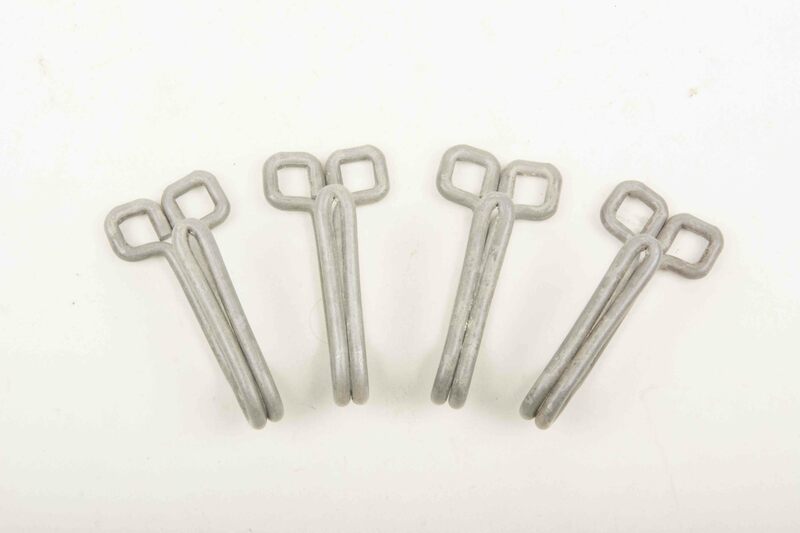 A perfect mint set for a pre war Heer or Waffen-SS M36 or M40 tunic in aluminum. 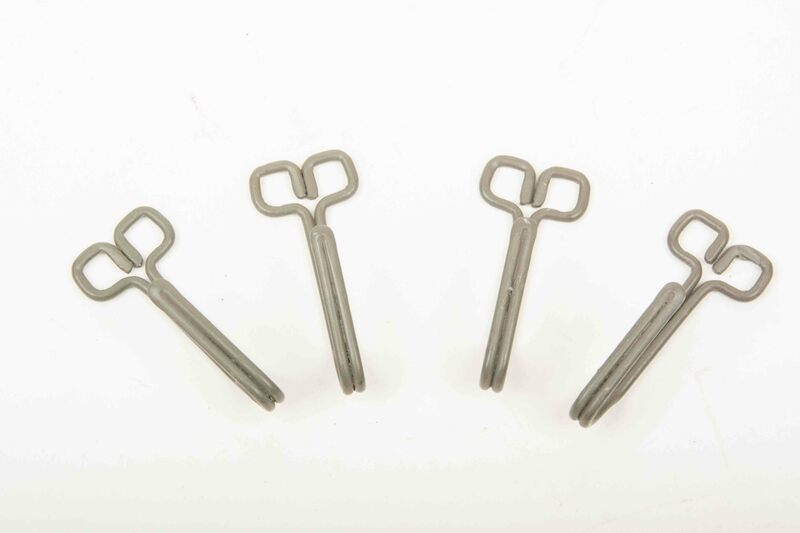 Hard to find spare set, especially in aluminum! A late war twill wool M43 Heer field blouse in good used condition. 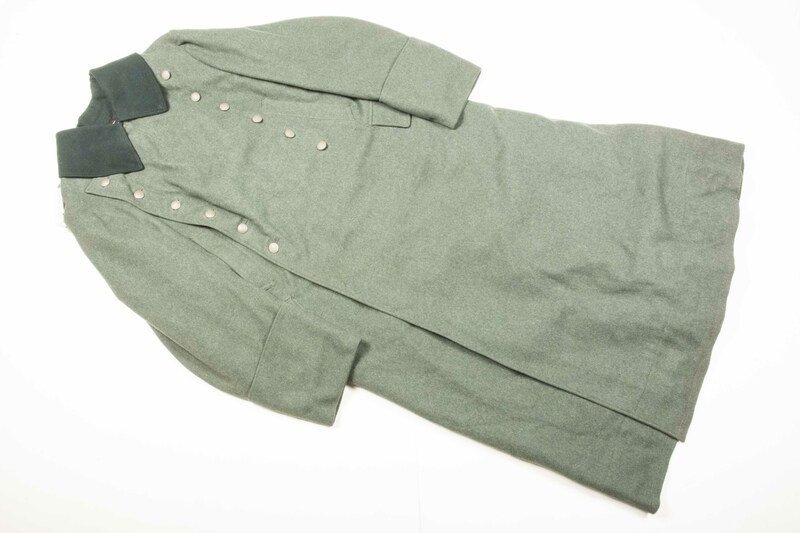 This is a rare variant M43 tunic made of a rough twill wool. The tunic is a nice large size and in good used condition. The tunic comes with machine sewn Litzen and a handsewn breast eagle. The tunic hasn’t been shortened or repaired and is marked F44. 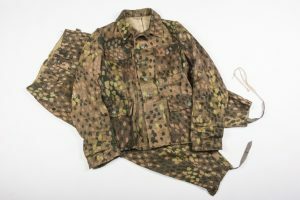 Rare late war combat tunic in great condition! A perfect mint set for a mid to late war Heer or Waffen-SS M40,M41,M42 or M43 tunic in green paint. Hard to find spare set, especially in green paint! 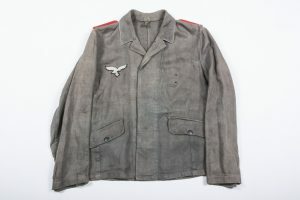 A perfect mint set for a mid to late war Heer or Waffen-SS M43 tunic in blue paint. Hard to find spare set! 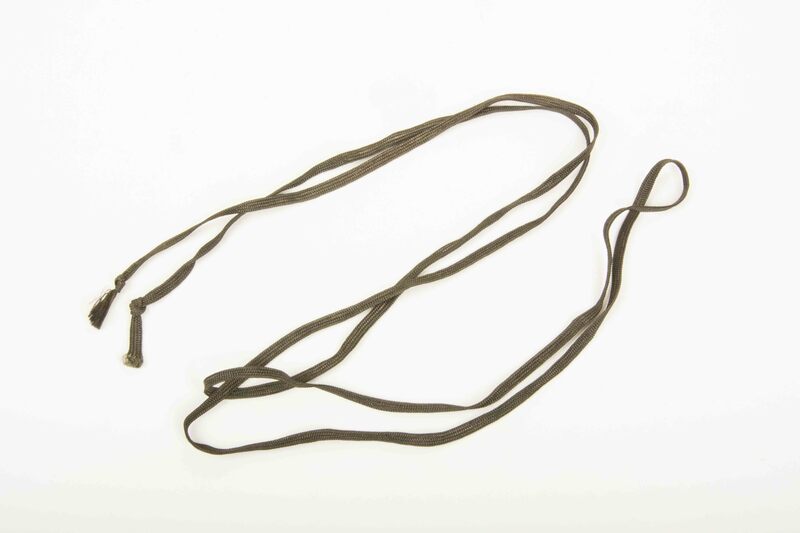 A scarce original Waffen-SS Tarnjacke drawstring. Typical flat woven rayon construction. Full length 130 cm. 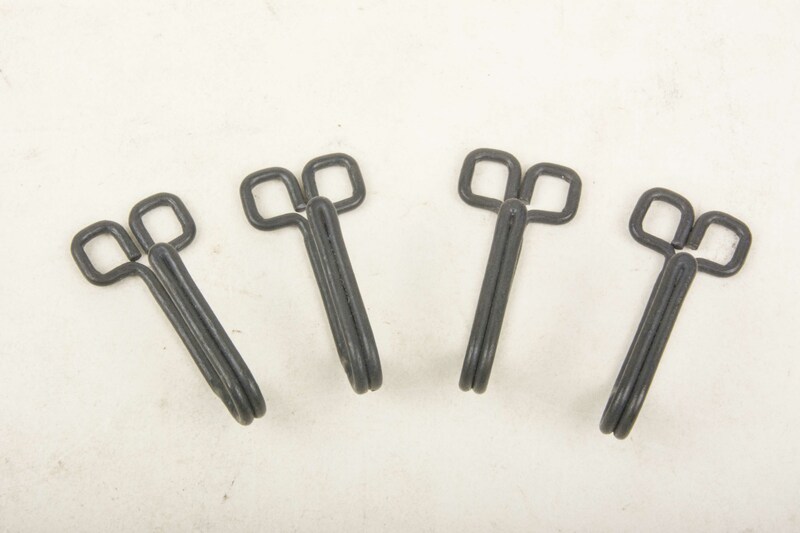 Downright impossible spare to find that was used in all types of Waffen-SS Tarnjacken from pre war to 1945! A perfect mint set for a mid to late war Heer or Waffen-SS tunic in blue paint. 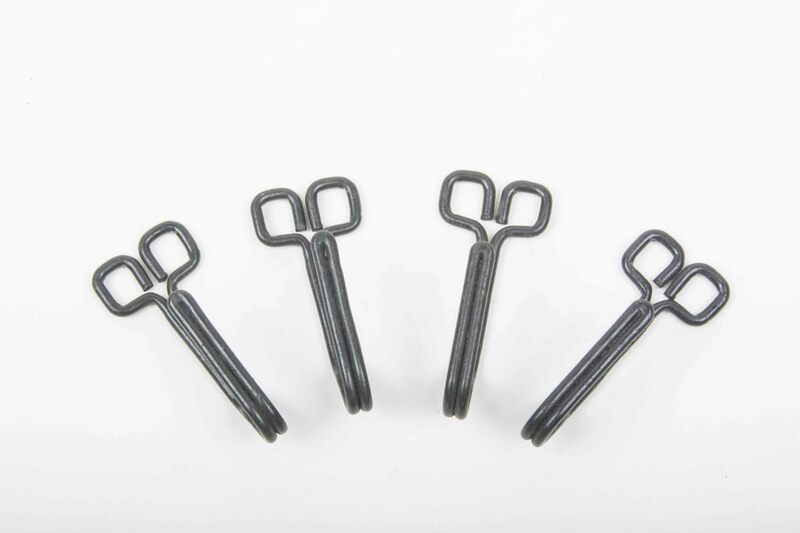 Hard to find spare set! 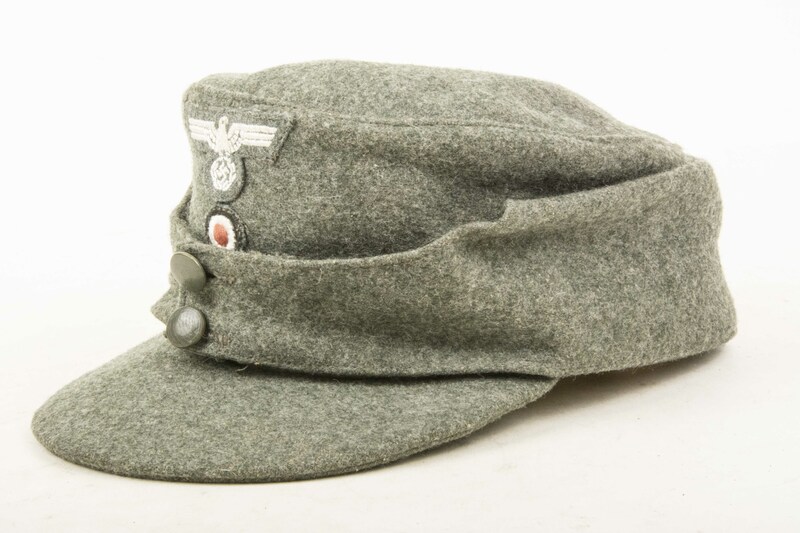 A original Italian made late war double button Heer M43 field cap. One of several collectible and rare to encounter variants. This variant, with machine sewn embroided insignia is made fully out Italian made materials. The buttons, fabric and insignia are all Italian made. A rare to find original M43 field cap! 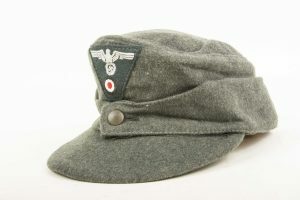 A original Italian made late war single button Heer M43 field cap. One of several collectible and rare to encounter variants. This variant, with machine sewn embroided trapezoid is made fully out Italian made materials. The button, fabric and insignia are all Italian made. A rare to find original M43 field cap! 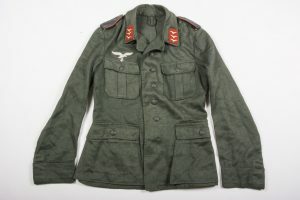 A nice and worn Kriegsmarine deck jacket. 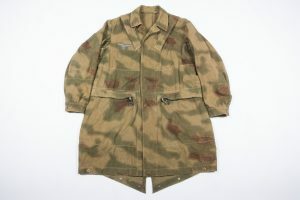 These jackets where favored by U-boot and also Panzer personnel as its material easily repelled wind and water. 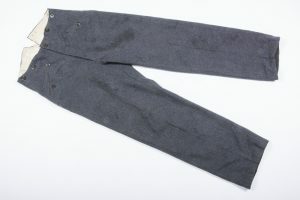 The garment is in strong used condition showing age and wear. The liner has some moth damage and some of the stitchings have gone over time. Still easily displayable jacket with lots of character! 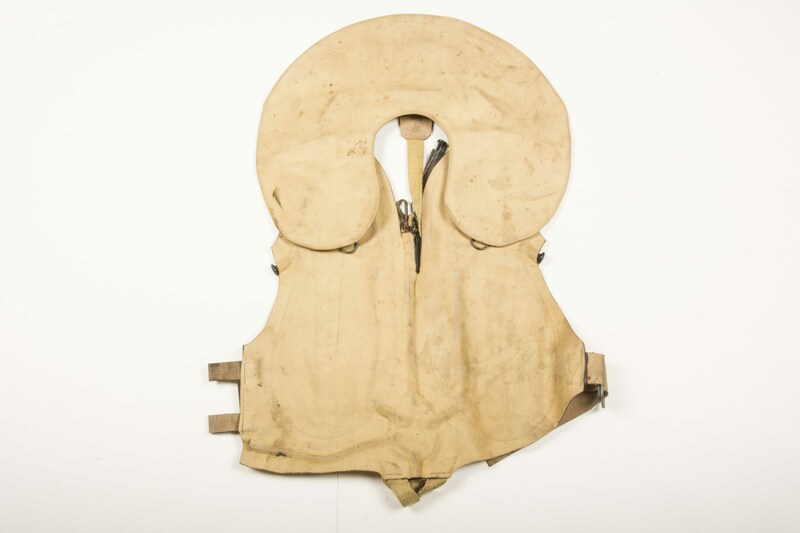 A very nice Kriegsmarine life vest in good condition. The rubber is in good supple condition. This variation comes without a pressurized air container. A very cool life vest to combine with a deck jacket! A nice and typical M36 mantel in great condition. The wool retains most of its nap and is in good condition. Some moth damage to the back of the mantel however! The shoulderstrap buttons have been replaced with “3” buttons indicating the owner was a member of the third company. Nice original mantel in good condition. Great for a equipment display! A very nice early war Wachmantel with Major shoulderboards. This mantel was the choice winter garment prior to the two piece reversible parkas where issued. The greatcoat is fully blanket lined and very heavy. One or two small moth holes but otherwise in mint condition! A very nice and typical Ostfront garment!